"I always get rave reviews when I make these enchiladas of halibut, green onions, fresh cilantro, sour cream, and Cheddar cheese." Season the halibut with garlic powder, salt, and pepper; cook in microwave until slightly cooked, about 2 minutes. Mix together the green onion, bell pepper, cilantro, sour cream, mayonnaise and 1 cup Cheddar cheese in a bowl. Gently fold the halibut into the mixture. Prepare a 9x13 baking dish with cooking spray. Pour 1/2 of a can of enchilada sauce into the bottom of the baking dish. Bake in preheated oven for 45 minutes. Top with avocado slices to serve. 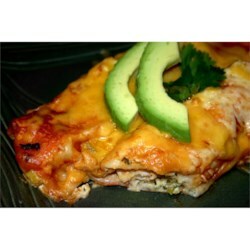 See how to make deliciously different seafood enchiladas. Yucky fish taste afterwards. Also very nauseous afterwards.